See it on Amazon Prime before they give it the axe! 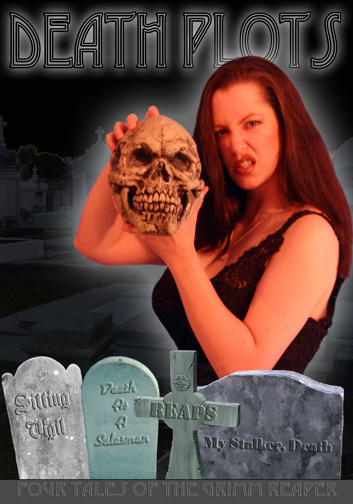 Debbie Rochon is back as Mistress Misty and this time she has 4 tales of Death Himself. See Joel D. Wynkoop as Swansong, a Reaper who can't always convince people they're dead. The aunt of an ill child fights to save the young girl's life in a dream dimension created by the fever. Stewart from "Sheep's Clothing" is back and this time he has to save a stripper from the mob in "My Stalker, Death". And Death tries to sell people on "Early Life Retirement" in order to solve the world's overpopulation problem. Special Guest Appearance by Lloyd Kaufman! Sorry, we can not ship outside of the United States. Please contact us directly if you would like to buy a download or wish to have a DVD shipped specialy so we can look into the cost. Need to Catch Up on the story lines? If you haven't seen "The Lunar Pack" yet check out the free online version in our ﻿Free Cinema﻿ !